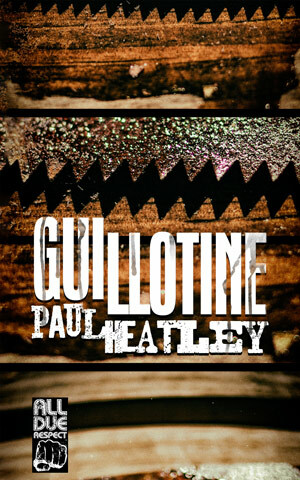 TAMPA, Fla. - Dec. 12, 2018 - PRLog -- Down & Out Books is pleased to announce that GUILLOTINE by Paul Heatley will be published by its imprint All Due Respect on February 22, 2019 in trade paperback and ebook formats. After suffering a lifetime of tyranny under the father's oppressive rule, when Lou-Lou sees a chance to make a break with the man she loves, she takes it. Problem is, daddy's also known as Big Bobby Joe, a dangerous and powerful man in the local area—powerful enough to put out a sixty grand bounty on the head of the man she's run off with, who also happens to be one of his ex-employees. With every criminal affiliate out looking for them, making good on their getaway doesn't seem promising. Even their so-called friends are on the take, willing to pull a double-cross if that's what's going to turn them a quick buck. But Big Bobby Joe hasn't counted on his daughter's resolve to distance herself from him. No matter what he throws at her, no matter what he does, she's going to get away—or die trying. Paul Heatley's stories have appeared online and in print for a variety of publications including Thuglit, Crime Syndicate, Shotgun Honey, Spelk, Flash Fiction Offensive, and Crime Factory, among others. He is the author of six novellas published, and An Eye for an Eye published by Near to the Knuckle. He is also a regular contributor to R2 magazine, and lives in the north east of England. All Due Respect has brought you low-life literature since 2010, publishing down and dirty novellas, novels, and short story collections from the best writers in crime fiction. Learn more at AllDueRespectBooks.com.